Swanage, Purbeck and the Jurassic Coast has spectacular history, landscapes and views that make it the perfect place to hold this festival. The course with around 3000 feet of climbs provides a predominately off-road route that is both challenging and rewarding. Please note that this is More than just a Marathon in more ways than one! The course is closer to 27 miles rather than the conventional 26.2. Don’t worry, the extra mile is the easiest bit of the course! Each entrant will receive a Medal and Event T-Shirt on completion of the event (see event prizes for details). What you need to know on challenge day! 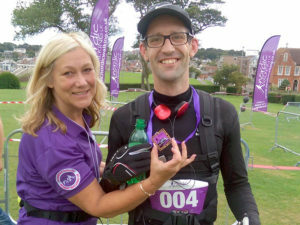 The Purbeck Nordic Walking Marathon starts and finishes in Swanage. From the Downs overlooking the beach, it heads towards Durlston Country Park and the Jurassic coast path before going through the villages of Worth Matravers and Kingston. Then it heads towards Swyre Head, to pass Heavens Gate and along the ridge towards Tyneham Cap. From here it leaves the coast path and runs through the deserted village of Tyneham. 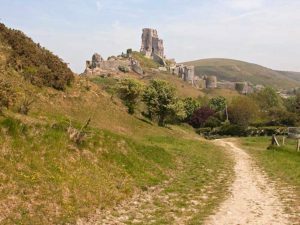 It then continues up and up onto and along the ridge of the Purbeck Hills towards Corfe Castle, to pass below the battlements of this 11th century castle and into the village square. The route then returns to the hill Ridgeway and heads towards Swanage to finish back on the seafront. The entire route has spectacular views which will help to combat fatigue. Weather permitting there will also be stunning views of Portland, Poole Harbour and the Isle of Wight. The Purbeck Nordic Walking Marathon has a number of hard climbs and uneven paths and will have checkpoints and water stations. This is a tough challenge, but where else can you do your post race icing by going for a swim in the sea! There is a time limit of 11 hours with progressive course closures so please bear this in mind and the course profile when applying. The Purbeck Nordic Walking Marathon is the main event of The Purbeck Nordic Walking Festival, a local community event, put on by volunteers and Nordic Walking UK, with the proceeds being distributed to charity. The Purbeck Nordic Walking Marathon has a maximum field of 250 entrants so make sure you get you entry in early. Conditions of Entry, Personal Health etc. Use the map control in the top left corner to select the layer you want to look at.